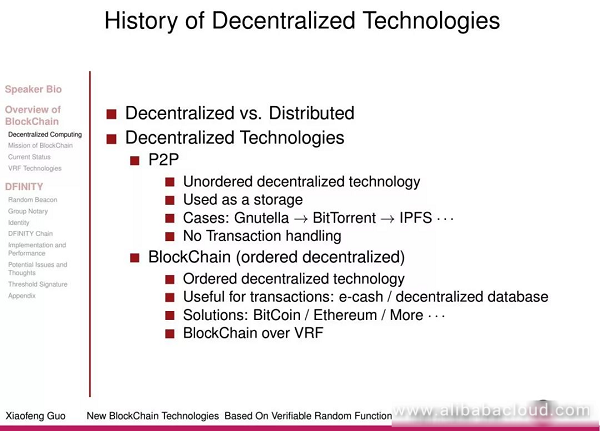 In this blog, we discuss various decentralization technologies and introduce new technologies, such as VRF, which forms the basis of the blockchain technology today. 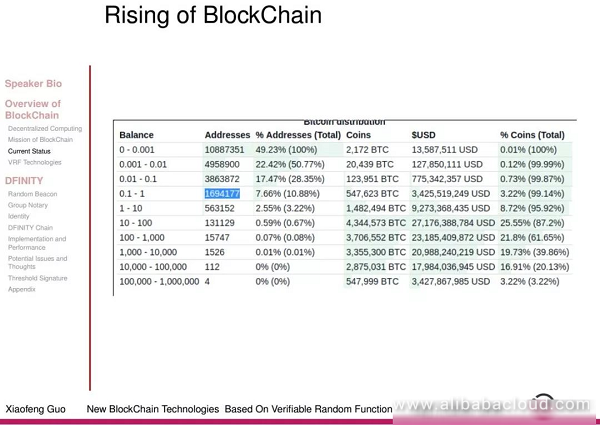 The blockchain technology isn't very mysterious, it's mainly a technology that provides a decentralized order. If we are to discuss it in depth, we should first talk about the development of decentralization and blockchain technology. 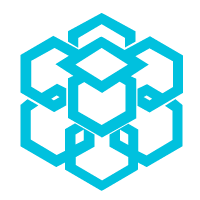 Decentralization is related to distributed technology, represented primarily by two leading technologies, P2P, and blockchain. Peer-to-peer is a type of unordered decentralized technology, wherein tasks and workloads get distributed among peer nodes in a distributed application framework. Representative use cases are the early Gnutella and BitTorrent applications. 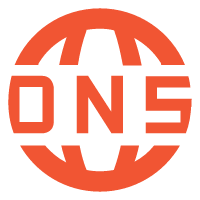 The recent, relatively popular InterPlanetary File System (IPFS) also falls into this category. The fact that makes this technology special is that events are unordered, making it impossible to support transaction processing. While P2P technology was quite popular at the beginning of the century, it's since failed to become a significant business application, primarily due to this shortcoming. On the other hand, the blockchain technology is a type of ordered decentralized technology that is useful in situations which require transaction processing, for example, digital currencies and decentralized databases. 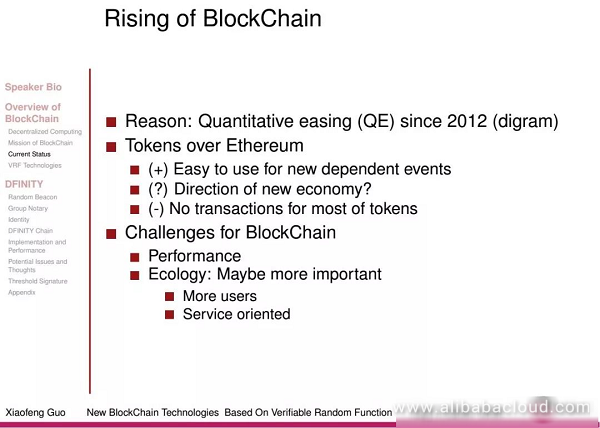 Familiar examples are Bitcoin and Ethereum. 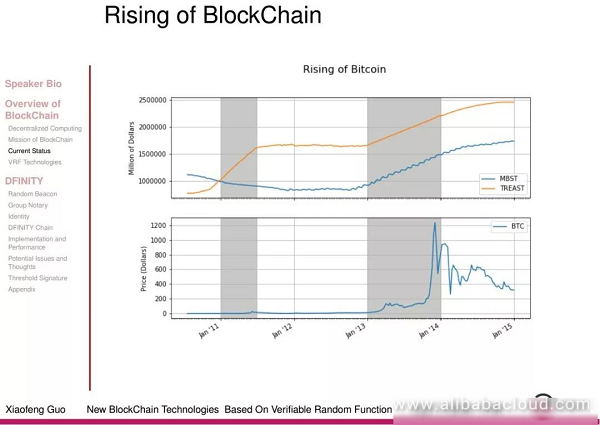 This article will describe the new generation of blockchain technology based on VRF (pseudo-random number generation algorithms). The end of the internet age may very well usher at the beginning of the blockchain age, in which the current C/S framework could get replaced by future peer-to-peer frameworks. 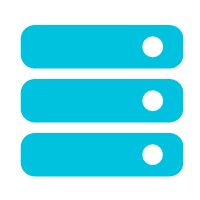 In this system, big data capabilities are still crucial to the performance of peer-to-peer nodes. Artificial intelligence allows us to gain a greater understanding of data and create even higher value. Blockchain technology combines public transparency with personal privacy protections to create a unique data platform. Firstly, primary blockchain technology must move a step further in development. Ultimately, the tallest buildings must get built on a solid foundation. Secondly, we must complete the implementation of decentralized transactions. Finally, we must provide users with concrete, practical services by such transactions. At last, technology is merely a tool by which we can change the world, create value, and ultimately provide services that help people. Undoubtedly, we need to prove application situations by reality. Moreover, we must emphasize that blockchain is primarily a platform to provide trust and highly efficient smart services, both of which are reliant on the further development of big data artificial intelligence technology. Bitcoin was the first public solution to make use of Proof of Work technology, and it is also currently the most widely applied. It is quite simple and does not easily changes by principle. However, PoW technology is far from sufficient. Its major shortcomings are excessive resource consumption and inefficiency, and its fairness is yet to get verified. 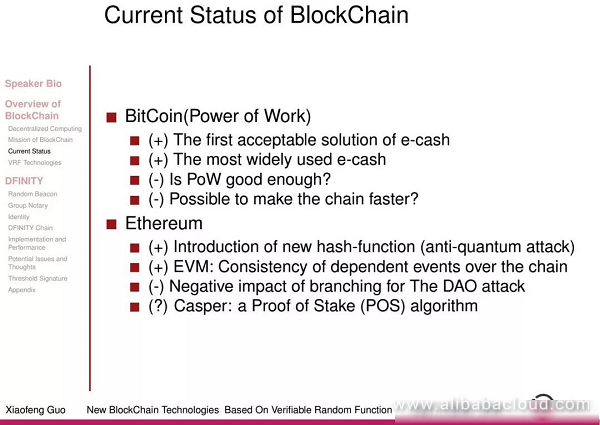 Ethereum uses a new system, called a hash function to guard against quantum attacks. It also offers EVM (smart contract virtual machine), which was a huge engineering breakthrough in the economic ecosystem. The most fundamental factor was the quantitative easing policy (QE). The real community has reversed the development of the technological society. The source of this chart is publicly available data from the Fed website. The MBST and TREAST parameters reflect the distribution trends of currency in the United States for the current year. In the gray area, we can see the relationship between the growth of currency issuance and the value of Bitcoin, as well as the point at which quantitative easing plays a role in the growth of the importance of Bitcoin. At present, Bitcoin gets used mostly for hedging against fiat economic events and plays a much less prominent role in the provision of services. The challenges faced by blockchain technology right now are performance and ecology, with ecology potentially being the more important of the two. Currently, 90% of Bitcoin is in the hands of fewer than 10% of Bitcoin holders, owing in more significant part to the method by which Bitcoin gets distributed. However, to form a healthier ecosystem, Bitcoin will have to attract more users, which will be a result of providing more services to users. 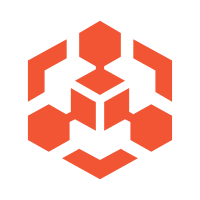 Earlier, PoW and related technologies have always sought to solve the issue of finding the next block indefinitely. However, this may not be possible to answer from the perspective of a computing instance, as computing instances are by default centralized. At this point, mathematicians have proposed that we solve this problem using VRF, a method of pseudo-random number generation. There are currently three main technical solutions, namely Algorand, DFINITY, and Thunder Token. 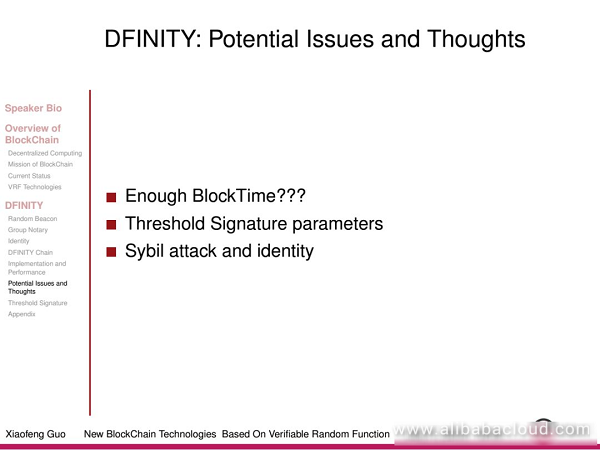 Here we will focus on DFINITY, a relatively mature, logically clean, and easily portable solution. However, the underlying technical details are generally difficult to understand because of cryptographic theory. 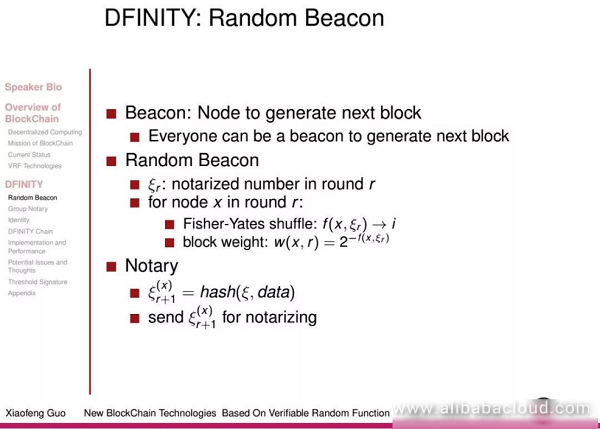 We use the random beacon method to answer the question of where the next node in the block is. 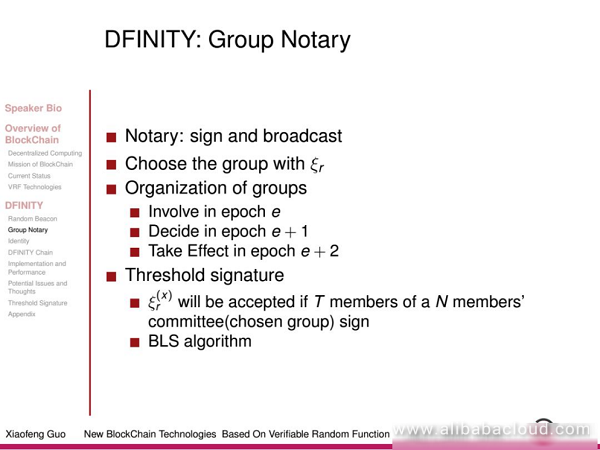 After the random beacon method determines the origin (node) of the block, the group signature method is then used to answer who confirmed and produced the block. 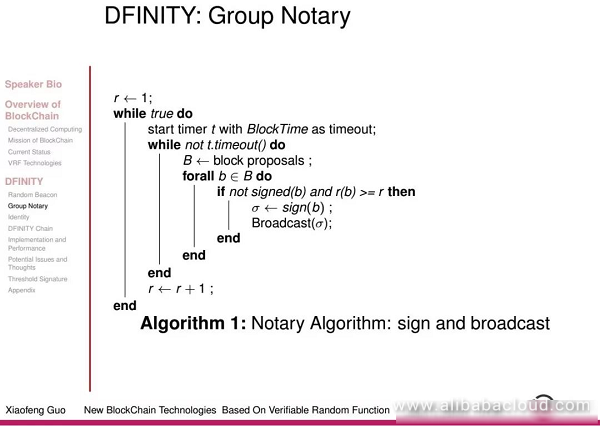 The group notary algorithm is approximately the same as shown in the figure below. Information is only valid if it T + 1 people sign it. We use identity to confirm users on the network. The entry of identity is similar to the entry mechanism of the group in which it requires two epochs before it can begin a new identity. 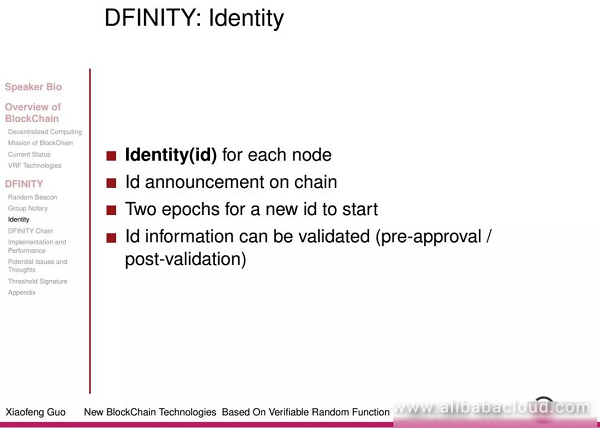 Once the above technical points get solved, we can finally form the DFINITY blockchain. The below figure contains the main points that need attention to include the three system parameter and initialization processes. For the threshold signature in the system parameters, the system needs to set the two statements T and N according to the requirements for guarding against Byzantine attacks. Having gone through a technical overview of DFINITY, I would now like to discuss some of the issues and advantages of using this technology. 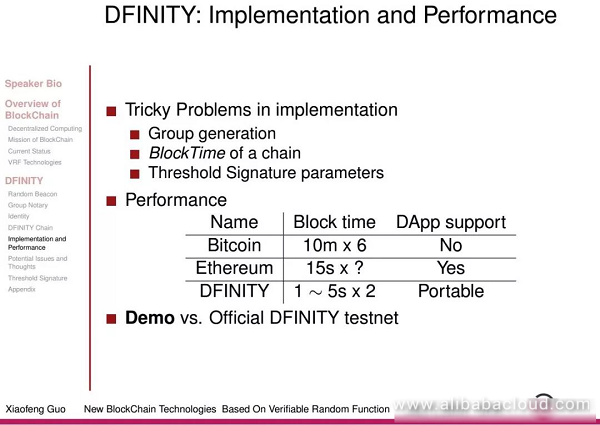 Following is a comparison of the performance of Bitcoin, Ethereum, and DFINITY respectively. We can see that DFINITY is more efficient than the first two technologies and features portable support for Dapps (distributed applications). At the same time, it still has issues with group formation, block time for the chain, and Threshold Signature parameters that have scope for improvement. 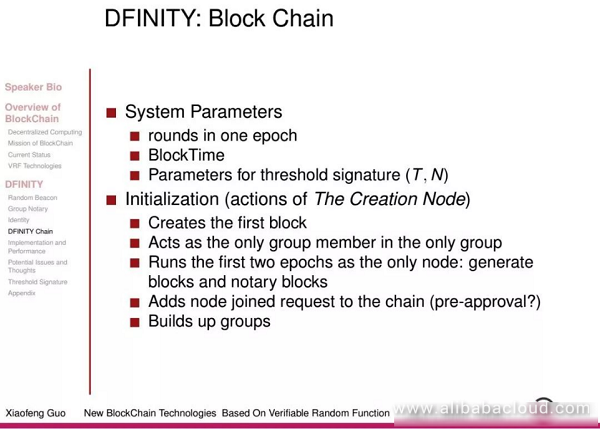 We have created the DFINITY demo based on DFINITY to serve as a more spontaneous demonstration of the chain's performance. Generally, DFINITY reduces resource waste and improves the efficiency of block generation in comparison to PoW technology, however it still has some shortcomings that are worth looking into. Nonetheless, there should be a purpose guiding the emergence of new technologies, so the aim of our technology must be at providing more convenient services to the human beings using it.